Sometimes, the hardest thing about constipation in children is trying to find out why the children are constipated. Some of the most common causes are allowing the child to drink too much cow’s milk, not eating enough fiber, and not drinking enough fluids generally. However, there are children that eat and drink in that way and are not constipated, so these are not the only factors that can lead to constipation in infants. It should be remembered that every child has different dietary needs. 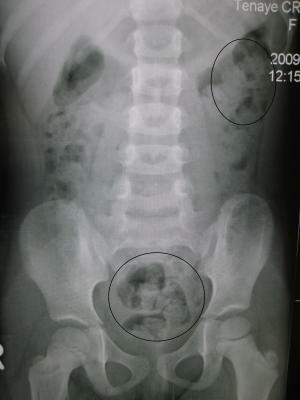 Sometimes constipation can result from the fact that a child has large and painful stool at first. Sometimes the child will be fearful of defecation after something like this occurs and hold in its stool as much as possible. This is when constipation can occur. Sometimes parents misinterpret this. They believe that the child is struggling to relieve itself and expel the stool from the body, when actually; the problem is that the child is straining the muscles and trying to keep the stool in so that it can avoid the pain that is associated with these types of bowel movements. It is important to have constipation in an infant carefully looked at by a pediatrician. Poor feeding often results in dehydration and constipation in children, that is why a pediatrician must evaluate the child’s feeding habits and see if it is gaining weight at a normal pace. Children that only breastfeed will probably have the lowest chance of becoming constipated. Initially, if the child is constipated, it is important to give it extra water or fruit juice. Another common home remedy is Karo syrup, which can be put into the child’s formula for relief. The medications that can be used for a child or infant with constipation are usually limited to Colace, maltsupex, lactulose and a glycerin suppository. It is important to modify the child’s diet as well. Decrease the intake of foods that can cause constipation, such as cow’s milk, bananas, yogurt, cheese, cooked and other foods that are naturally low in fiber. Instead of regular milk, soy milk can be given to the child instead. A child needs at least 6 grams of fiber each day. Fruits and vegetables should be given to the infant to eat, especially kidney, navy, pinto and lima beans, sweet potatoes, peas, turnip greens and raw tomatoes. Other foods that are encouraged are vegetable soups and popcorn as well, which children love. Two to three glassed of either water or fresh fruit juice are encourages as well in order to get rid of the child’s constipation naturally. Suffering from chronic constipation. Nothing is helping. Is it safe to use Fleet Phospho-Soda for severe constipation after Hemorrhoidectomy?